The minutes came out just a week after Fed chairman Ben Bernanke alluded to the possibility that further QE and stimulus was needed in the US economy, which pushed equity & commodity markets up. Very contradictorily, the minutes suggested the Fed’s appetite for further quantitative easing had waned. However, the Fed and Bernanke have received much criticism for the ultra loose monetary policies of recent years and the ostensibly somewhat more hawkish stance may be an attempt to position the Fed as being monetarily prudent and wishing to protect the value of the US dollar. Prudent investors will rightly remain skeptical and will as ever judge the Fed by its actions and the data rather than its words. With interest rates remaining near zero and continuing negative real interest rates, and these set to continue in 2012 and into 2013, monetary policy is set to remain extraordinarily accommodative. Gold’s bull market will almost certainly continue as long as we have negative real interest rates. Gold’s London AM fix this morning was USD 1,631.75, EUR 1,239.65, and GBP 1,027.75 per ounce. 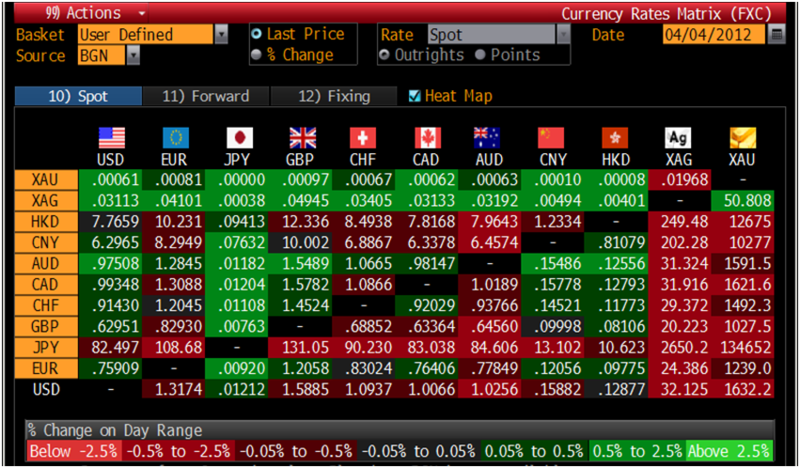 Yesterday's AM fix was USD 1,674.75, EUR 1,254.03 and GBP 1,044.17 per ounce. Silver is trading at $32.01/oz, €24.31/oz and £20.16/oz. Platinum is trading at $1,622.20/oz, palladium at $640/oz and rhodium at $1,350/oz. Gold fell $30.70 or 1.83% in New York yesterday and closed at $1,646.30/oz. Gold traded sideways in Asia prior to a further $10 drop after the open of European trading. Heightened risk aversion saw all markets fall yesterday after the Federal Reserve said inflation appears to be under control and suggested that the Federal Reserve may be reluctant to further debase the dollar with more QE. This weakness continued in Asia where the Nikkei fell by 2.3% and European indices are down this morning. Gold’s bull market will almost certainly continue as long as we have negative real interest rates (see chart below). 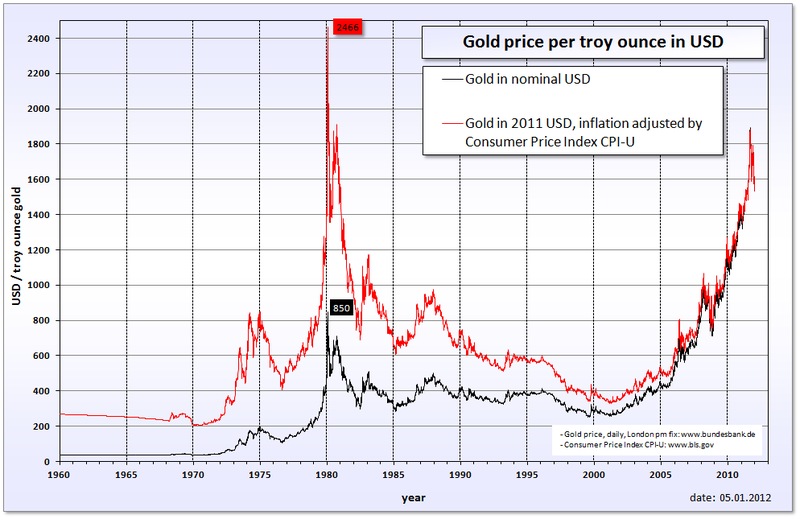 Gold’s price peak in 1980 came about when US 10 year bonds were yielding over 12% and with rising real interest rates. Today the US 10 year is yielding a historically low and negligible 2.26%. Real rates are have risen marginally but levels below 2% have been supportive of rising gold prices. The degree of monetary debasement seen in recent years means that gold’s inflation adjusted high of $2,400/oz remains a very viable price target. Indeed, the scale of the European and coming US debt crisis and the real risk of currency devaluations makes $2,400/oz a conservative price target in the long term. The Standard & Poor’s GSCI gauge of 24 commodities fell 0.2 percent to 698.74 at 5:12 p.m. in London. The UBS Bloomberg CMCI index of 26 raw materials was down 0.2 percent at 1,622.201. In the GSCI, corn was up the most, at 1.1 percent, and cocoa was down the most, at 2 percent. Corn rose, heading for the biggest three-session rally since May, as demand for immediate supplies climbed after inventories fell to an eight-year low in the U.S., the world’s top exporter. Soybeans gained to a six-month high. Corn futures for May delivery rose 1.2 percent to $6.63 a bushel on the Chicago Board of Trade. A close at that price would mark a three-day rally of 9.8 percent, the most since mid- May. Soybean futures for May delivery climbed 0.4 percent to $14.27 a bushel. Earlier, the price reached $14.3425, the highest for a most-active contract since Sept. 7. Copper dropped for the first time in four sessions in New York as increasing inventories of the metal cast doubt on the outlook for demand. Copper futures for May delivery fell 0.1 percent to $3.9185 a pound on the Comex in New York. The metal climbed 3.4 percent in the previous three sessions on gains in U.S. and Chinese manufacturing. Prices increased 11 percent in the first quarter, the most since 2010. On the LME, copper for delivery in three months slid 0.2 percent to $8,620 a ton ($3.91 a pound). Markets in China, the biggest global user, are shut today. Tin and aluminum declined in London. Nickel, lead, and zinc advanced. Natural gas gained for a second day in New York on forecasts for cold Midwest weather next week that may boost heating-fuel demand. Natural gas for May delivery rose 3.6 cents, or 1.7 percent, to $2.188 per million British thermal units on the New York Mercantile Exchange. The futures have slipped 27 percent this year, the worst performer on the Standard & Poor’s GSCI Index of 24 commodities. U.K. natural gas for May was little changed amid ample supplies of the heating fuel and lower-than-normal demand even as exports to Belgium increased. Day-ahead power was stable. The May contract was at 59.7 pence a therm, according to broker data compiled by Bloomberg. That’s equal to $9.57 a million British thermal units. A therm is 100,000 Btu. Oil pared losses in New York as U.S. stocks rebounded from today’s lows and gasoline prices gained. Oil for May delivery fell 59 cents to $104.64 a barrel on the New York Mercantile Exchange. It climbed 2.1 percent yesterday, the most since Feb. 21, after U.S. manufacturing in March expanded at a faster pace than estimated. Oil is 5.9 percent higher this year. Brent crude for May settlement slid 21 cents to $125.22 a barrel on the London-based ICE Futures Europe exchange. The European benchmark contract’s premium to New York-traded West Texas Intermediate was at $20.58, widening from $20.20 yesterday, the biggest spread since October. Cocoa futures fell, heading for the longest slump this year, on signs of ample supplies amid slowing demand. Sugar and coffee also slid. Cocoa futures for May delivery declined 2 percent to $2,171 a metric ton in New York, heading for a fifth consecutive drop, the longest slide since the period ended Dec. 29. The price tumbled 7.2 percent in the previous four sessions. Raw-sugar futures for July delivery fell 1.4 percent to 23.44 cents a pound in New York. The sweetener dropped 0.2 percent yesterday. Arabica-coffee futures for May delivery retreated 1.3 percent to $1.8375 a pound on ICE. The price jumped 5.5 percent in the previous two sessions. In London futures trading, cocoa, refined sugar and robusta coffee slid on NYSE Liffe. Gold dropped for the first time in three sessions in New York on concern that physical purchases are declining and as a rise in the dollar reduces the appeal of the metal as an alternative asset. Gold futures for June delivery fell 0.2 percent to $1,676.30 an ounce on the Comex in New York. The metal rose 1.5 percent in the past two sessions. Before today, prices were up 7.2 percent this year. Silver futures for May delivery slid 0.3 percent to $32.995 an ounce, the first decline in four sessions. Before today, silver increased 18 percent this year, the best-performing metal on the Standard & Poor’s Spot GSCI Index of 24 commodities. Jewelers in India, the world’s biggest bullion buyer, extended the longest ever shutdown for a 19th-day protesting against a 1 percent excise duty on non- branded gold ornaments, a trade group said. Jewelry associations are meeting in Mumbai today to decide on future courses of action, Bachhraj Bamalwa, chairman of the All India Gems & Jewellery Trade Federation, said by phone today. The industry is demanding the excise tax be withdrawn. Gold imports by India, the world’s biggest bullion buyer, may plunge as much as 50 percent in the first quarter after a build up in inventories during a nationwide strike, said Ajay Mitra, managing director, Middle East and India, with the World Gold Council.